People are injured every day in Nevada, and not all injuries fit into an easily defined category. The good news for you is that in Nevada, they do not have to. If someone else is responsible for your injuries, there are legal mechanisms through which we can hold them accountable. And for our personal injury clients, unless we recover, you do not pay attorney’s fees. So we don’t get paid unless you get paid. If someone has acted in a way that the law considers unreasonable, and their actions caused you harm in a foreseeable way, you may recover for your losses. These losses include not only medical expenses, but can include other consequential losses like lost wages, lost household services, loss of consortium, loss of earning capacity, loss of enjoyment of life, and pain and suffering. The attorneys at Parry & Pfau have not only litigated cases involving car accidents, trucking accidents, construction defects, boating accidents, product defects, and slip and falls, but also less conventional injuries, including those involving automatic doors, intermodal train yards, and faulty sidewalk construction. No matter what the mechanism of injury, we can help determine whether you can recover your losses that resulted from the carelessness or intentional acts of others. For more information about these types of cases, click on the link and give us a call. 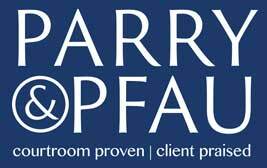 If you have questions about other injuries, call anytime and speak to the friendly attorneys at Parry & Pfau. We are also easily reachable by email or through the contact forms on this site.